All right, I have a neat, little list of things my players want in this campaign world. They like a world with high magic. They like a world with non-interventional gods. They prefer more than one religion or pantheon. They like a world with blank spots on the map. They prefer shades of grey in their morality. They want cultures with a rich history and tension between nations because of that history. They want complex relationships between cultures. They want to see competition amongst nations not just on the battlefield, but in commerce, diplomacy, land grabbing, resources, and other areas where real world countries could get into it. I should mention these are all things I am happy to include. If they weren’t that might be a conversation I’d have to have with the players, but that’s another blog post. Let’s talk inspiration. I need to create a world that organically has all of these items in it and I still need a good place to start. Ripping off your favorite campaign setting (mine is Eberron) may seem like a good place to go, but why put in all that work if the thing you want already exists? Trust me, it’s worth the money for the campaign guide. Your favorite movies and books can also seem a great place to start, but for me, I want something more original. If I have a magical order of knights running around with colored swords, my players immediately think Star Wars. And knowing these guys, they’re going to call it out immediately. I can’t blame them, it’s what I would do to them. Oh, believe me, I’ll borrow a concept from time to time from another work of fiction. Stealing is where creativity begins. But for my world’s inspirational idea, its central theme or event if you will, I wanted to go beyond genre tropes. It was a challenge. I find it helpful to write all that stuff down if you can so that you can save it for later. It may seem weird, but jotting down a list can also help get an idea you don’t want to use out of your head. Ideas that are somewhere safe make your brain feel ok to let it go, freeing you up to think new things. I keep a google doc of D&D inspirations. Just a big list of things like “super strength minions” and “villain like the Joker” and “mine cart chases are awesome.” When I’m stumped for an adventure idea or the players go somewhere unexpected, it’s a great way to grab some ideas. Sorry, I digress again, but I wanted to drop that advice on you. So I looked back at what my players wanted – complex relationship between many cultures, rich history and tension between countries, non-interventional gods of more than one religion, competition on and off the battlefield amongst nations, morality that isn’t black and white… this is sounding very familiar. It’s actually a lot like the real world. Our world that we actually live in. Maybe I can find something within the real world. Of course, two bullet points were a problem for me. #1 – blank spots on the map, of which our world has none. Problem #2 – all races and classes available. Last time I checked, the real world didn’t have warforged (yet… looking at you, Apple) and no one is actually a professional necromancer (looking at you, Pfizer), but I’m willing to let that slide. The real problem with #2 – Wizards is going to continue to put out new material beyond this Summer. Those supplements are sure to include new races and at least a few new classes (I’m pretty sure we’re going to see psions at some point or the nerd rage will explode the internet). How can I introduce those newer races and classes post-campaign launch? If we get a new player or someone builds a new character and wants to be a minotaur soulknife, story-wise, how can I justify that? I’m not going to say no after promising all races and classes are available, especially if they’re creating a new character because my monster or trap is the reason their old one perished. 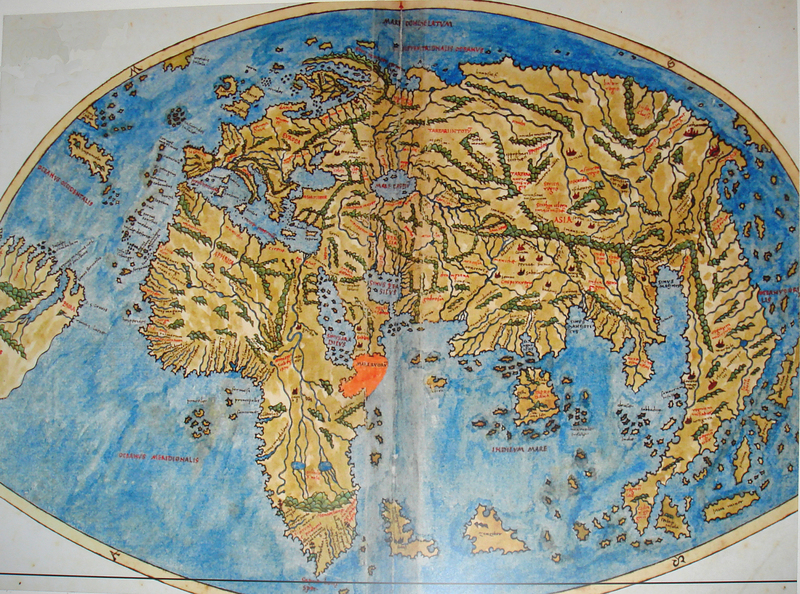 Map of the world from before the discovery of the Americas. Map of the world now. That’s a lot more world. Twice as much. Could you imagine if that happened today? Your head would explode. This hits all my points. New technology brought forth by the Renaissance is equivalent to the neat high magic discoveries that will exist in my world. European countries were trying to make trade routes and relationships with Asian countries while grabbing up all the land they could in the Americas. They had conflicts with Native Americans, a new culture and people. There was uncharted, undiscovered lands galore. Relationships amongst nations were complicated. People demanded religious freedoms. Colonies fought starvation and disease. Artists created everlasting pieces. Wars were fought. The list goes on. So my world will have many established nations with their own relationships and history, who have just discovered new lands and are doing everything they can to grab land and find resources. Meanwhile these established nations are trying to make trade routes and get the goods and resources flowing in and out of their respective countries. This all sounds like a recipe for adventure to me. There’s already so many places a party could go to carry out twenty levels of awesome. It will be important for me to remember that this idea is meant only to inspire the events and background of my campaign world. It’s not going to be a copy of our world, but I can pull ideas, tweak them, combine them with others, and sprinkle in entirely new ones. What if one of my undiscovered lands was crawling with dinosaurs, or a band of marauding sky pirate dragonborn ran havoc on the airways? What if the king of one of the established nations was actually a five-year old girl shapeshifter? What if one of the countries biggest exports was adamantine? What if one of the colonies decided to rebel against its father nation (sound familiar? Looking at you, Thomas Jefferson). So now that I have my inspiration my goal is to use the central idea (new lands discovered) and turn it into a land my players and I will love. People, we have a starting point! Next up… it’s time to meet the nations….